One of our previous blogs explored some of the various misdemeanor assault charges in North Carolina. This blog will explore some of the various felony assault charges in North Carolina. Felony Assault Charges are governed by the North Carolina General Statutes. Any person who assaults another person and inflicts physical injury by strangulation is guilty of a Class H felony. uses a deadly weapon other than a firearm. Many people have heard of these felony assault charges. In North Carolina, assault with a deadly weapon with intent to kill or inflicting serious bodily injury is a felony. If a person assaults someone with a deadly weapon with the intent to kill that person, it is a Class E felony. If a person assaults another person with a deadly weapon, and the assault results in serious bodily injury, it is a Class E felony. 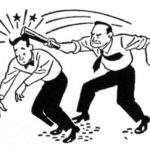 If a person assaults someone with a deadly weapon with the intent to kill AND the person inflicts serious bodily injury, it is a Class C felony. What is serious bodily injury in this context? In North Carolina, a “deadly weapon” is basically anything that could be used to kill someone. A gun, knife, car, ax, baseball bat (or other blunt object) could all be considered to be deadly weapons. If you would like to learn about misdemeanor assault in North Carolina, check out our blog on misdemeanor assault in North Carolina here. If you have are facing an assault charge in North Carolina, you should contact a criminal defense attorney immediately to discuss your options. The criminal defense lawyers at Gilles Law can provide you with insight into your charges. Call us at 980-272-8438.